The laboratory is interested in defining basic mechanisms of gene expression regulation in mammalian cells. We do this through alterations in transcription factor potency as mediated by phosphorylation or by alterations in subcellular localization. Alternatively, transcription factors also participate in multiprotein complexes with each other as well as with basal regulators of transcription such as p300 / CBP or histone deacetylases (HDACs). 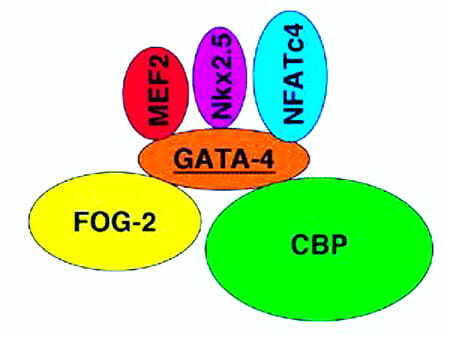 For example, the cardiac-expressed zinc finger-containing transcription factor GATA4 interacts with CBP / p300, as well as a large number of other cardiac-expressed transcription factors. An understanding of basic transcriptional regulatory mechanisms will shed new light on the regulatory paradigms that underlie cellular differentiation and various disease states.